It’s difficult to imagine the shock she must have dealt with in 1830, the difference between life at Keppoch House in Scotland for the previous eighteen months and her new life beside the Blackwood River in Augusta, in an isolated tent. The settlers were days away by sea from the British colony in Perth and that’s when there was a ship available. It was more than a year before their government supplies arrived. They had nothing they didn’t bring with them on the voyage from England and the land they planned to farm was uncleared bush, including huge trees. They nearly starved. But arriving in Western Australia wasn’t the first time Georgiana had been forced to adapt to enormous change. Her father died suddenly, leaving the family with such large, unexpected debts that they were forced to leave their elegant home, sell everything they could and live from hand to mouth by accepting the hospitality of friends, moving around and leaving bills unpaid for as long as possible. Of course, life was still comfortable and privileged in many ways but the Kennedys’ fall from their place on the highest rung of Cumberland’s social ladder, and the restrictions on their lives, must have been a significant change of circumstances for young Georgiana. Her personal writing reveals how much she loved her father and admired him. She knew him as a man of influence, one who spent his days mixing with the wealthiest officers, landowners, and distinguished citizens and his nights attending glittering social occasions. He was a Justice of the Peace and became Deputy Lieutenant for the entire county of Cumberland when Georgiana was five, one of the highest positions available. At first, the young family lived with David Kennedy’s mother-in-law in her fine house in the centre of the city, in considerable luxury. He was among the wealthy gentlemen who purchased a Game Certificate each year, at three guineas, that would allow him to enjoy hunting as a sport and his name appears frequently on the lists of jurors at the Carlisle Assizes. In 1803, Kennedy signed up with the Loyal Carlisle Volunteers. He was already an experienced soldier even though he had never seen battle and he became a captain at the same time as Georgiana’s dear friend Burky (Birkett) and Robert Mounsey (who would be Mrs Kennedy’s solicitor and adviser fifteen years later when she had to deal with the financial fallout her husband’s death). Did Kennedy decide it was his duty to help defend England, his wife’s country, from Napoleon or was he just missing the good things about military life? If France invaded, he would probably have seen action but, if not, there was a still lot of practising required, regular displays in front of the most influential people in the county and celebrations to attend. He resigned from the regiment in April 1805, a few weeks before Georgiana was born, but surviving records of the military pageantry and the splendour of his world allow us an insight into the man that Georgiana knew as her father. They also indicate how stark the sudden change must have been when that way of life came to an end. This newspaper report describes one of the impressive events David Kennedy took part in, a whole day of military and social display, watched by the local nobility, the soldiers’ families and most of the inhabitants of the city. The celebrations did not end until five the following morning. It gives us a view of the kind of life Mrs Kennedy and her children enjoyed until the summer evening in 1919 when ‘the Captain’ was brought home unconscious after a fall from his horse. For Georgiana, at fourteen, everything changed. Wednesday last, being the anniversary of the birth of our gracious Queen, was observed here with every demonstration of joy. In honour of the consort of our beloved Sovereign, it was also set apart for the presentation of the colours of the Loyal Carlisle Volunteers. They were presented by the Right Hon. Lady Anne Vernon, Lady of the Hon. and Right Rev. 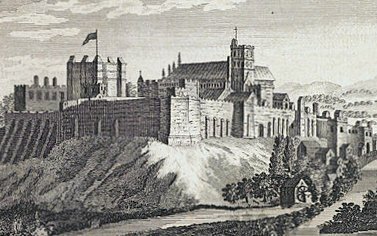 the Lord Bishop of Carlisle, to Major Thomas Halton, the commanding officer of the corps, in the Castle Green, in the presence of a number of ladies and gentlemen of rank, and perhaps the greatest concourse of people that ever witnessed a public spectacle in this part of the kingdom. The regimental colour is the city arms, on a blue field, entwined with the rose, thistle, and shamrock; the motto, “Our God, our Country, and our King;” on the other side, Pro Aris et Focis, the whole beautifully embroidered by the Ladies of Carlisle. After the ceremony, the guns of the castle fired a salute from the six-gun battery and the gentlemen of the band of the Cumberland Rangers played from the parapet of the west bastion, many loyal tunes. The whole extent of the castle’s west rampart was lined with the ladies and gentlemen of the town and neighbourhood. Upon the ground, immediately before the corps, were many people of distinction. The crowd began now to disperse and the corps, being formed into a line of four deep, marched from the castle to the cathedral, where the evening service was read. It concluded with a solemn benediction from the Bishop and a grand military voluntary upon the organ. During the ceremony of consecration, the aisles and choir of the cathedral were crowded with spectators. Perhaps never upon any occasion was the church so thronged. The battalion now marched into the Market-place, and being drawn up in a line, were dismissed, after being near five hours under arms. In the evening a most brilliant and numerous assembly concluded the amusements of the day. The colours were placed at one end of the ball-room. The room was crowded by an assemblage of rank and fashion. Nothing could exceed the splendour and richness of the dresses, both of the ladies and gentlemen, displayed on this occasion, and the whole formed a gratifying and beautiful spectacle. About ten o’clock the dancing commenced, when above sixty couples stood up. The ball was opened by Major Halton and Mrs. Colonel Howard; and the dancing continued with the greatest spirit. The company did not separate till five o’clock the next morning. Transcription from the Carlisle Journal by Petra Mitchinson.